(TIMES OF ISRAEL) — A day before Passover, farmers in southern Israel were suffering from another plague of locusts, entering the country from Egypt with biblical timing. The pests hit fields and greenhouses in the south; the Agriculture Ministry was working to prevent heavy damage to crops in the Negev and stop the insects from penetrating deeper into the country. 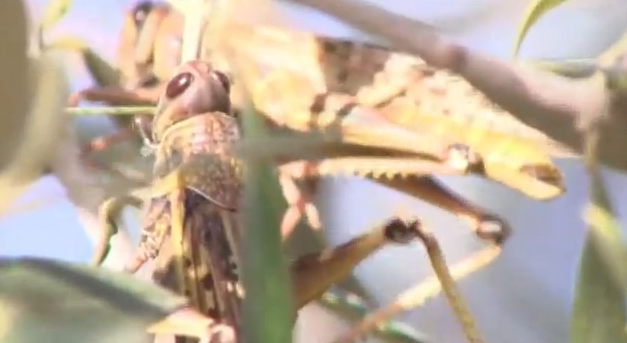 Unlike previous swarms that have entered Israel in the past month, the locusts that hit Israel Sunday are yellow and fertile and, in this stage of their metamorphosis, pose less risk to crops because they eat significantly less. Once the insects lay eggs and they hatch, however, Israeli farmers will face the threat of this wave’s insatiable brood, who will eat anything green in their path.